Here you will find a good Brownie Recipe but re-visited with vanilla that boosts the chocolate flavour. While remaining an original combination, this recipe has proven to be an all-round favorite as it combines the well sought-after taste of chocolate with the freshness of spring. Preheat your oven to 350°F (180 °C). Line a rectangular tin about 8×12 inches (20×30 cm) with greaseproof paper. Melt the chocolate and butter (cut into pieces) in a double boiler. Beat the egg whites until stiff with 2/3 of the sugar and set aside. Whisk the egg yolks with the remaining sugar until the mixture is creamy and then add the vanilla, flour and ground almonds. Finally, add the butter / chocolate mix and mix well. Add the stiff egg whites, mix gently and pour half of the mixture into the tin. Beat the cream with the mascarpone, vanilla extract and sugar. Add the eggs and continue to beat for 2 minutes until the preparation is homogeneous. Pour the vanilla cream on half the chocolate cream. 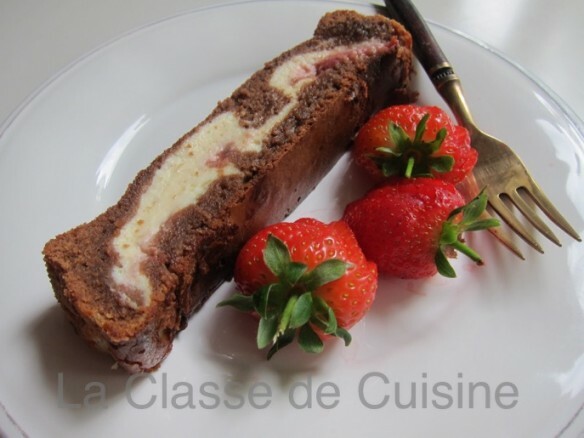 Put slices of fresh strawberries on top and cover with the remaining chocolate cream. Bake about 30 to 35 minutes. Let cool before unmolding. Enjoy with some sliced fresh strawberries.